We are living in times of constant change, where the renovation rate is increasingly fast-paced, and when we seem to be reaching the limit, another innovation comes up and puts us straight back on the wheel. With us being authentic advocates of permanent improvement and innovation, it is soothing to discover that well-grounded and well-executed concepts remain stable inside the vortex, endorsing the benefits of what is well-thought-out from the beginning. For a couple of years now, the audio-visual market has had an extensive array of options that have not ceased to grow, let alone surprise us, namely: larger sensors, incredible sensitivities, fantastic collections of lenses... Sometimes, consolidated tools, with which lots of professionals all over the world overcome their daily business, remain firmly in their position without needing to attract so much attention. This is so because, in all reality, they continue being the tools used to produce most of the content consumed every day in the majority of the media. We believe this happens with what we are about to discuss in our laboratory today. At the hand of Panasonic, we now have the little sister of its new 4K compact UX professional production range, presented during the last NAB. It is the AG-UX90. While it conserves the concept of handheld, compact and lightweight camcorder with a fixed lens and all the elements traditionally demanded by professionals, it does meet all the technology requirements and current needs; and with a very attractive price. It has same traditional compact handheld/semishoulder camcorder format weighing in just at over two kilos, including battery and cards, and at a slightly lower cost compared to many HD cameras of a few years ago. It is an all-new model, totally renovated with very interesting features where “everything is new” technologically speaking, “everything is better” as regards the product and yet, “everything is the same” concerning concept. You obtain maximum performance from day one with utmost ease and comfort. Any camera operator could pick it up and virtually without even looking at it, begin to operate it from the start with no complication whatsoever. 8.8 x 15 f2.8-4.5 Leica Optical Zoom, equivalent to a 24.5-315 in universal standards with a 5-axis optical stabiliser and three independent control rings. 1.0-Type MOS sensor (we shall soon see what this means) that permits recording in Ultra HD at 25p, in Full HD at 50p/25p and even in SD with different types of codecs and files. Double SD memory card slots for relay or simultaneous recordings. Remote control from an Apple iPad using the free AG ROP app and an optional USB wireless receiver. Among other connections, it has XLR audio inputs, a HDMI output and two USB 3.0 connections. In short, a UHD/HD tool designed for the professional user that provides all the necessary elements to capture images in the best conditions possible permitted by today's technology. It has same traditional compact handheld/semi-shoulder camcorder format weighing in just at over two kilos, including battery and cards, and at a slightly lower cost compared to many HD cameras of a few years ago. Let's begin our analysis with the sensor. As regards the size, "1.0-type" refers to a "new measurement" used by several manufacturers, which do not usually give the real physical measurements. The popular conception is that it is the size of an inch (as it is sometimes called) but in all reality, this is not so. This reference refers to the size the sensor of a one-inch pipe would have and that turns out to be somewhat lower. In any case, it is an intermediate size between the traditional 2/3 and the 4/3. In other words: When the sensor is too big (Super 35 and Full Frame, for instance), we gain in sensitivity and dynamic range, but the depth of field is so small that it makes it difficult or impossible to operate in ENG or documentary-type environments. However, if the sensor is too small, the depth of field can even be excessive and compromise the sensitivity and the dynamic range, leading to the appearance of noise due to the tiny size of each pixel. There seems to be much agreement in that this size offers a good balance between the manageable depth of field and sensitivity with minimum noise. We must also bear in mind that the sensor is handled differently when we record in UHD (3840x2160) to when we record in HD (1920x1080) because they read different surfaces of the sensor, which natively have more than 17 million effective pixels. In fact, Panasonic specifies different equivalent focal lengths when filming in one format or another in their documentation. Thus, the optics, which physically is 8.8-132 mm (f2.8-4.5) on HD, is equivalent to a 24.5-367.5 mm, whereas in UHD it equals a 35.4-531.0 mm. This is surprising, because this means that it would be reading a smaller portion of the sensor for UHD. We imagine that it treats each pixel as such without scaling. In HD, however, it uses a larger area, probably combining several native pixels for each pixel of the end image. In any case, the images we obtain are always clear and crisp, thanks to the optical quality of the lens, made by Leica, which combines a x15 optical zoom with different digital zoom options, which can also be combined with the iZoom or intelligent zoom. This enables multiplying the scope of the lens from x2 in UHD to x250 in HD. As expected, the first option does not cause any sensitive alterations to the quality of the end image, whereas the defects usually associated to these mass enlargements are evident in the latter option. Here, the relevance of the content and the intelligence of the operator will set the limits of what is reasonable, with the help of multiple intermediate enlargement options. To handle the lens, we have three conventional rings for the focus, zoom and iris. None of them is mechanical. The iris ring enables us to configure the direction in which the diaphragm opens or closes. As regards the focus ring, we also have the possibility of controlling its behaviour configuring it from the menu, being able to vary its response. In addition to the expected fast and slow modes, we also have a variable that makes the response speed proportional to the speed with which we turn the ring. Thus, fast turns offer great leaps, whereas the slow movement allows more precise adjustments. And if the focus precision is important in HD, in UHD, it is critical, so all the help is welcome. In addition to this assistance for the focus and the classic on-screen enlargement and colour highlight of outlines under focus, we have another two that contribute to keeping the image with the highest precision, and which we consider fascinating: the optical stabilisation system and the auto focus with follow-up. The stabiliser is capable of handling and correcting by controlling a hybrid 5-axis system, which we thought was very efficient, even though what caught our attention most was that it only appears to work in HD recording. The auto focus is a user-adjustable system where we can adjust the speed, sensitivity and detection area, which enables us to have a system very fine-tuned to our needs. In addition, we are also able to select the exact point to focus at the touch of the screen at any moment. Now that we are talking about operation, let's see what other elements we find on the outside. We loved having sufficient buttons for an efficient handling and that they are all where they should be. We have exclusive function buttons/selectors, such as the 4-position neutral density filter (0, 0/4, 1/16 y 1/64), others with a determined function but with configurable values, such as the gain (adjustable between -3 and +30 dB), the turning wheel acting on the selected parameter (colour balance, gain, shutter, size or the focus area, menu options...) and other adjustable ones that may have an allocated function by default, to which we can assign any of the 44 functions of the camera. We have no less than 13 of these allocatable buttons, 9 of which are distributed over different parts of the body and 4 on the screen. Of course, even though we have not listed it, we have all the standard functions of a professional camera such as selectors to activate or deactivate the auto/manual modes in the iris, focus, gain, white balance selector with memories, zebra marker, etc. 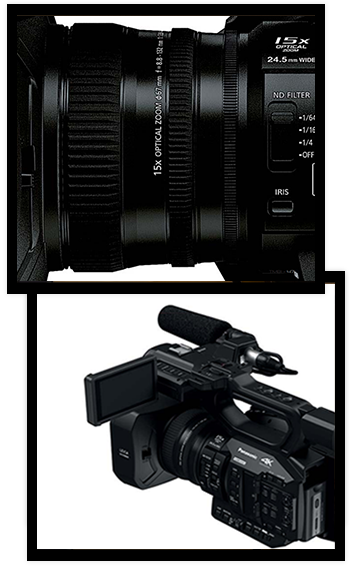 As regards audio, all the expectations of a camcorder of this level are covered, with the only curiosity of assembling the second XLR on the rear right-hand side of the camera instead of the classic double connector next to the external microphone stand. It has an integrated microphone, and it comes without a shotgun mic, so we can use whichever one we choose, which comes as a standard in this type of equipment. We feel that it was a good feature that the audio control lid on the lefthand side could be opened in full to minimise its accident rate. One of the elements that have also varied a lot over time as regards function is the screen. Screens used to be a mere passive visualisation element but now, they are a crucial part of the control. Not only does this one have buttons for certain functions both in replay and recording functions, but also, and as we have already mentioned, if we touch the image we can establish and control the focus points, auto focus, iris, etc. It offers a good image quality with a fairly reliable colour, brightness and contrast on replay, on its 3.5 inches. The anchorage system, which protects it very well once slipped into its housing, has the limitation of only being articulated around one axis, preventing some positions, although this isn't a major inconvenience. To finish with the upper part, we can see that the handle has a second recording startup/stop button and a second servo for the zoom. The loudspeaker to monitor contents recorded without needing headphones is located under the screen housing and the optical viewfinder with a lens and dioptre adjustment is located on the rear. The screen and the viewfinder have colour, brightness and contrast adjustment functions through the menu. It also offers 4 threads to attach accessories in the upper region, but very well lined up with respect to the camcorder’s centre of gravity. As far as recording is concerned, we are thrilled to have two SD memory card slots instead of the standard formats, because nowadays this storage medium has sufficient characteristics to cope with both the volumes and the high rate of necessary data, provided the SDHC or SDXC types are always used with the appropriate writing speeds, that is. There are two slots that will permit relay recording for unlimited or parallel recording, but in this case, both media need to be of the same type, and they will always record the same selected format on both cards. All the formats use LongGOP compression, that is, the interframe type. UHD is always recorded at 25p with a bitrate of 100 Mbps, LPCM audio and in .mov or.mp4 container. Higher quality HD can be 50p, 25p or 50i, at a 50 Mbps bitrate with the same audio and container as above. From here on, and in AVCHD format with AC3 audio, we have different frame sizes (from 1920x1080 to 720x576) in 50p and 50i variants, and bitrates between 25 and 5 Mbps. Translated into times per capacity, and taking a 32Gb card as a reference, we will be able to record 40 minutes of UHD content at 100 Mbps or 80 minutes of HD at 50 Mbps, in .mov or .mp4 formats. In AVCHD, the more we reduce the size and frequency of the frame, the more we will get, from 2h 40m to more than 13 hours. The speed of the cards to be used will be in line with the formats in which we intend to record, where U3 (UHS Speed Class 3) is recommended for the 100 Mbps mode, U1 (UHS Speed Class 1) for 50 Mbps and C4 (SD Speed Class 4) will be sufficient for the AVCHD modes. Through the menu, we can access and configure many parameters that will enable the camera’s response adjust to the most varied of conditions. We especially liked the skin detail control differentiated from the general detail. The 8 gamma modes, including several cinema ones, the colour matrix control with knee and pedestal adjustments, the possibility of saving and loading these profiles in memory cards to equal the response between cameras or keep the pre-established settings for frequent and different situations or work environments, and the shutter with speeds of up to 1/8000. On the other hand, we were surprised to find characteristics that seemed highlights to us and that nearly go unnoticed, such as the option for a pre-rec to count with an additional 4 seconds (3 on AVCDH) of recorded content BEFORE pushing the record button, the compensation of the number of flashes during recording or the possibility of uploading contents to a USB or external disc via a USB host connector without needing a computer. It is also noteworthy that, although it records at 8 bits in 4:2:0 internally, it offers the same bits but at 4:2:2 on the external output. Other curious details are the super-gains option of +33 and +36dB, the ability to take photos at 8 Megapixel or the fact that the composite video output is always active in SD format, regardless of the selected recording format, unlike the HDMI 2.0, which can be configured. The screen, in addition to it being a touch screen, can display an enormous amount of information, fortunately also configurable from the menu. Our recommendation is to leave all the necessary information visible to be able to verify that everything is as we wish at a glance, but remove it from the screen while we are recording. Although, as with everything else, our needs and what we are accustomed to, will lead to each situation requiring its own treatment. The audio volumes, the histogram, the zebra marker or the horizon level are good examples information that is critical in some cases, but completely unnecessary in others. The battery included in the box, AGAG-VBR59 of 7.28v and 5900 mAh (43wh) says it needs 3h20 to charge and bears 7h 10m continued recording. The maximum optional capacity states a battery life of up to 14h 10m. We already know that these data are optimal laboratory data and we do not have our own field tests. However, we do know for sure that for normal use, in which we start, stop and sometimes review the material, change the settings, prepare plans, etc., and which we can estimate at around 75% of the optimal autonomy, the times continue to be remarkable. At this point, you will all no doubt have your own experience and references as per the usage, environment, and conditions under which you operate your equipment. Now that we have used it, we can say that it feels like a solid, reliable, a good feel and lightweight piece of equipment. It inspires trust and is very intuitive to use, because all the control elements are precisely where we expect to find them. The touch screen has two sides, very comfortable and fast for many functions, but not always as clean as we may have liked. The focus system is very fast, an important advance compared to earlier models. The colour and dynamic response also appeared to be clearly much better compared to earlier models. The possibility of configuring image profiles and colour matrices will rarely require some adjustments to accommodate the result to the wishes of the most demanding operator. Sensitivity has also improved, and we need to increase the gain significantly before we get some noise. In this aspect, the personal sensitivity of each operator and each client will establish the different limits for each occasion. The digital zoom in its more moderate variants is effective, but the others seem to be exaggerated. In any case, there they are in the event of us needing them, and the content to be recorded is more important than the end quality. At the end of the day, it will be the operator who establishes the priorities. In seeking the limits and without being subject to the subjectivity of the admissible noise threshold or the acceptable digital enlargement of the image, objectively, we have detected clear rolling shutter effects in fast horizontal sweeps (horizontal deformation of vertical elements when there are horizontal camera movements), this being the only usage limitation we have encountered. For those who need autonomy and mobility with a high level of HD equipment without it being overly expensive and that permits providing UHD content to clients that need it. For those who seek versatility in their main or single camera in news and documentaries, and in productions where the cost per content is crucial. As one or several B cameras in higher-level UHD productions. All in all, it is a great HD camera, with good UHD performance where we must not forget that we have all its extraordinary features available for a price that was unthinkable not so long ago, because we would be speaking about around €2,000 before taxes including the power supply, one battery and charger for two batteries in parallel. This enables us to offer the very best of today’s technology at very contained costs. With this camcorder, we can offer high competitiveness without relying on investments that tie us down to repayment term that end up conditioning our possibilities of evolution and future growth. 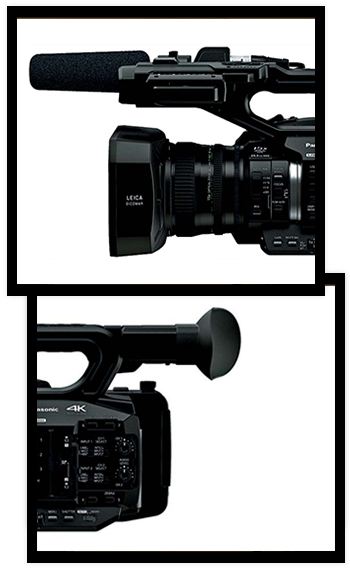 And if, despite all its good things, you still feel that you need to take another step forward, its bigger sister, the AG-UX180 offers a true 4K recording (4096x2160) at 24p, slow motion in HD up to 120 fps, a 20x zoom with an angular equivalent to 24 mm, simultaneous multi-format recording, infra-red recording, 3G-SDI connectivity, time codes, 50/60 Hz commutation and all this, keeping a highly competitive price in the region of €3,000 before taxes.